Tennessee Governor Signs Controversial Late-Term Abortion Ban – Newsmakers Live! Tennessee Governor Bill Haslam signed a controversial piece of legislation into law on Friday which bans late-term abortions, reports The Tennessean. On July 1, Tennessee will become one of at least 21 states that explicitly ban abortions beyond viability. But the measure, called the Tennessee Infants Protection Act, goes further than most other bans and could become the subject of a lengthy court challenge. According to the outlet under the new measure, dubbed the Tennessee Infants Protection Act, doctors who don’t abide by the law can have their licenses annulled and face up to three years behind bars. 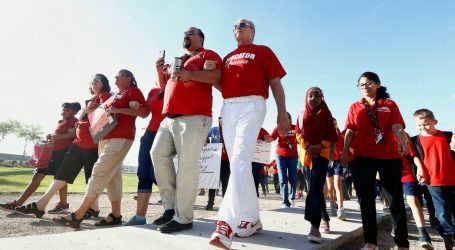 Arizona’s Governor Just Caved and Offered Teachers a 20 Percent Raise. They’re Not Satisfied.